The Panasonic SR-MS183 is an updated version of the older SR-MS182 model, yet as we mentioned on the page reviewing the smaller SR-MS103 5 cup version nothing new is really brought to the table. Both SR-MS182 & MS183 models seem identical and perform really well. This new Panasonic rice cooker has a nice amount of settings that folks should find useful to have in the kitchen. First off, let’s state that this model uses a monitoring technology called Fuzzy Logic that pays attention to how the selected rice type is cooking and will make temperature and overall cooking time adjustments along the way. The outcome is a batch of rice with a nice aroma, texture, and flavor that is greater than those made in cheaper rice cookers. As for the actual settings, the machine has specific selections for making: white rice, brown rice, and sticky rice. One user stated that using the brown rice setting for preparing wild rice brings good results. Besides rice, the owner also has the option to steam food, slow cook stews and soups, prepare porridge, and even bake the foundation for a cake. For slow cooking we’ve discovered there is a 12 hour total cook time but the user does not have the option of high or low temperature control, something that we favored on the slightly better Sanyo ECJ-HC100S rice cooker slow cooker model. Also, for steaming food we are not sure if this can be done while cooking rice below or if the tasks must be performed separately. For folks who own this unit, please contact us about that. 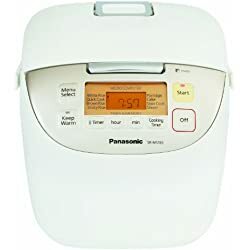 Included with the Panasonic SR-MS183 is a measuring cup, steam tray, non-stick binchotan-type charcoal bowl enhancing rice aroma and flavor, a rice paddle, and manual. The cooker has a 10 cup total capacity which yields approx. 30 cups of cooked white rice. Perfect for household ranging from 5 to 10 people. Other features found on this 10 cup cooker is a 24 hour timer that folks can set to create an approx. finish time, (ex. set it up in the morning to finish at 5:30 PM), and a 12 hour keep warm mode which will hold the rice at an ideal serving temperature without drying it out. The Panasonic SR-MS183 cooker also sports a condensation collector located at the back and a domed lid design which helps prevent water dripping onto cooked rice. For cookers that are less expensive yet offer similar features, please see our Aroma Cookers tab. We also recommend folks check out the Sanyo ECJ-HC100S which offers several more options (see Sanyo Cookers tab). Tip: to prolong the internal battery life keep the unit plugged in. Keep in mind that the cooker will still perform properly without the battery as it just runs the clock when the unit is unplugged. Life of battery is approx. 4 yrs.